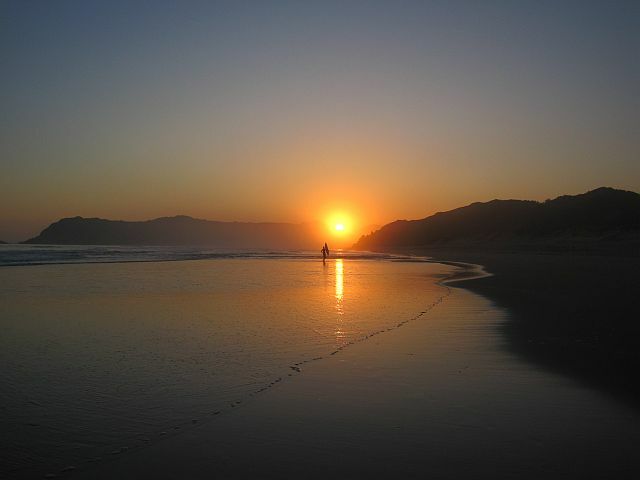 The Garden Route is a popular holiday and retirement destination. Coming from Cape Town, it begins around Albertinia which is a tiny and not too exciting place. Give it a miss. 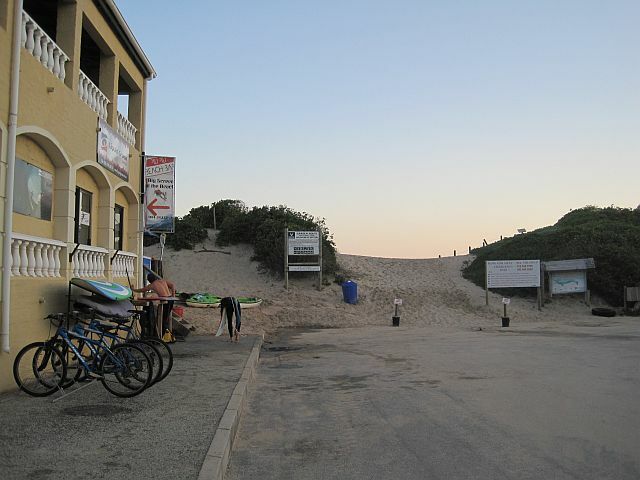 The first coastal town is Mossel Bay (Mussel Bay). Mossel Bay is hardly a town. It is a big place and the road passes through the outskirts of it. The other end of the Garden Route is at the Storms River Mouth. Place names like Natures Valley and Lake Pleasant give a clue to the beauty that this area holds. A mix of lakes, lagoons, estuaries, rivers, forests and mountains are what make it such an attractive place. 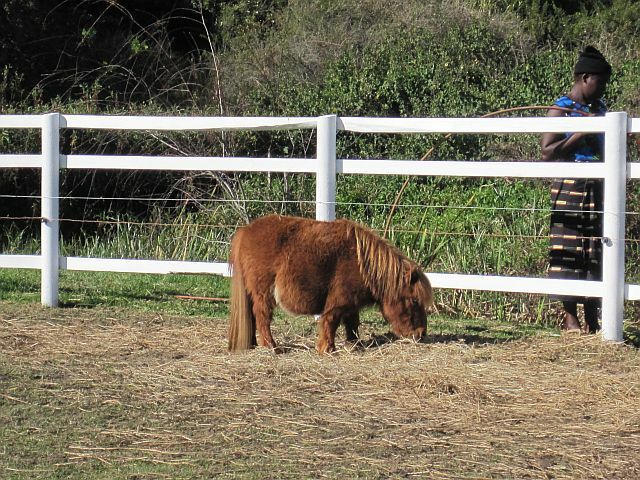 Dwarf and mini horses for kids to stroke. This is Henry. You can get there by hiring a car and driving. Visit these links for price comparisons of the various car hire companies in South Africa – option 1 and option 2 and lastly option 3. The roads have recently been re-done and long queues seem to be over for the most part. The views along the way are special. Bus companies to consider are Baz bus which is a hop-on hop-off bus. Links to other inter city coach bus operators are Intercape, Greyhound and Translux. Maybe you might like to do a motorbike trip through the Garden Route? Follow these links – MotoBerlin and AdMo. Have yourself a Harley holiday. I would be wary of the intercity trains. I read the local news and I don’t feel I can recommend them. The Blue Train or a special train is fine. There are organised cycle tours. I have included a link for those who would relish a chance to sit on a saddle and cycle – mountain biking in South Africa. I would strongly discourage anyone from hitch hiking in South Africa. And I’m not sure I would couch surf either. I know of people who have done some couch surfing in SA, and maybe it’s just me, I don’t like to take that sort of risk. I mentioned in the last few posts that I spent a week in the Garden Route. We took a day trip to Wilderness twice. The first time we took a relaxed approach. We had a meal and wandered around the shops. The second time we decided to paddle a canoe up the river, into the forest, for a picnic. 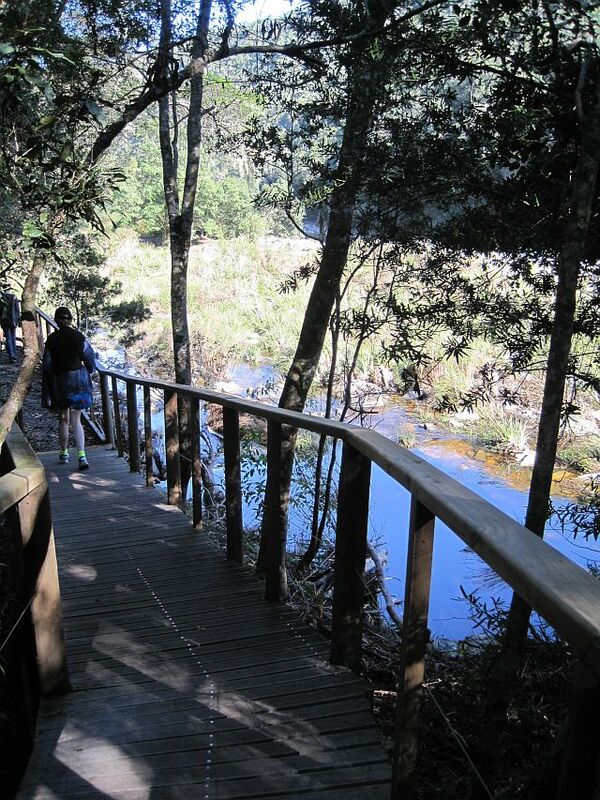 The river and the forest are set in the Garden Route National Park. 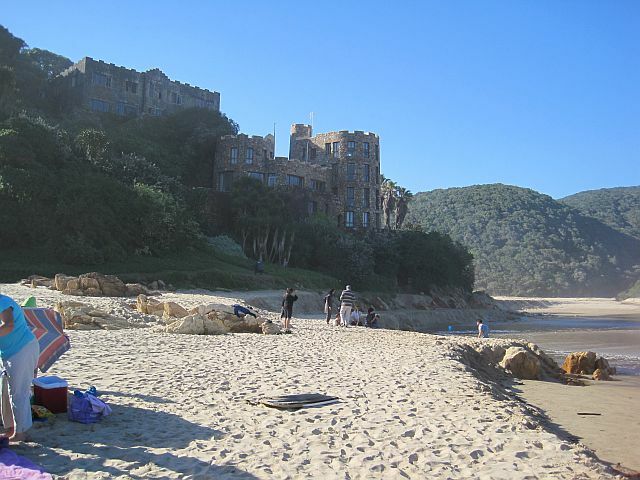 Click on this link for more – Garden Route National Park. I have to be a bit honest. My canoeing skills are not all that. We rowed against the tide when we went for our picnic and when we came back as the tide had turned. My arms ached. The river got a bit rocky in places and we had to get out and push our canoes to get them going again. The river water was freezing cold. I couldn’t feel my feet. But it was fun. 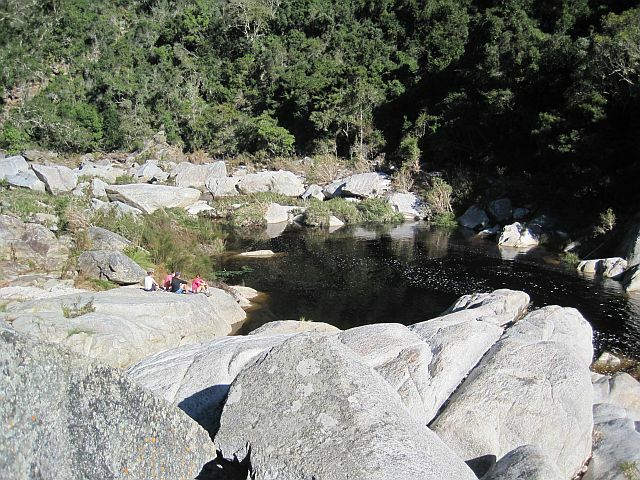 Once we arrived at the waterfall area we relaxed in the sun, listened to the birds and the water splashing in the rock pool. I could barely move after a while. It’s definitely one way to de-stress. The company we got our canoes from is Eden Adventures. Follow this link to find them – Eden Adventures. They have all sorts of activities for a person to do. We passed wooden lodges and rondavels as we paddled the river. SA National Parks hire them out to visitors. Go back to the first link for our local national parks and find out more there. They even have a webcams so you can view wild animals. What is a rondavel? It’s a unique South African word for a round dwelling. Wiki explain all here – Rondavel. Wilderness area also has a long soft sandy beach. The sea water is warmer than in Cape Town. Sea water gets warmer as you head up the coast toward Durban. The Garden route is definitely a must-see. It’s the Garden of Eden of South Africa. You can do nothing more than simply soak up the scenery. Or you can get more adventurous and go canoeing, visit the Cango Caves nearby in Oudtshoorn or ride an elephant in Knysna. You will find plenty to suit your inclinations. 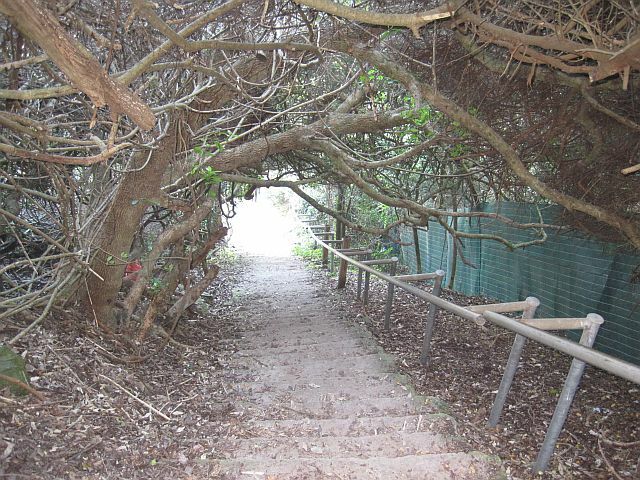 More links here – Knysna Elephant Park. Why it is not a good idea to play with elephants – elephant attacks handler. And – Cango Caves. I spent a week in Sedgefield when I went to the Garden Route recently. The Garden Route is a magnificent area on the south eastern coast of South Africa. It is a mix of lakes, forests, breathtakingly beautiful beaches and lush verdant vegetation. Each area has it’s own distinct character. 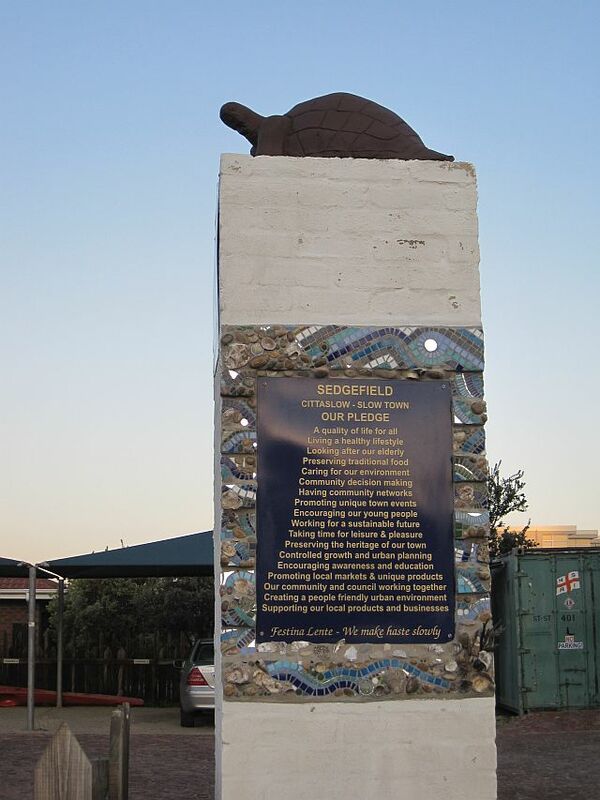 Sedgefield is South Africa’s very first slow town. It has been confirmed by Cittaslow so it must be true. Sedgefield might not have the glamour of Plett or Knysna but it certainly has a lot more charm. There are massive and inviting soft sandy beaches. Tranquil lagoons, plenty bird life including flamingos and the ocean is home to whales, dolphins and other marine life. Who would want to shop with all this natural beauty? I would recommend a visit to the Wild Oats Organic Market on a Saturday morning. I would also suggest taking a cycle trip on one of the many magnificent routes. What better way to spot a Malachite Kingfisher or any one of the birds in the area? There are hides to view the bird life on the lakes. A walk to watch the setting sun on one of the beaches is a MUST. And behind Spar is an Italian restaurant. Trattoria da Vinci. You have to eat there. Well priced, relaxed easy atmosphere and fabulous food. I had an aubergine parmigiana. It was excellent. Google Tourism Sedgefield for more on Sedgefield Tourism and do pick up their brochure. It’s free and lists cycle routes, hides, hikes and more. I just spent a week in the Garden Route. The reason I went down, or up, depending on which way you look at it, was to run the Knysna Half Marathon. It’s one of the nicest races in South Africa. They limit the race to 7000 entrants and although that is a lot, other races attract nearly double that amount. They also have a cycle race, a Mardi Gras, and their annual Oyster Festival at the same time, so there were plenty people and activities happening. 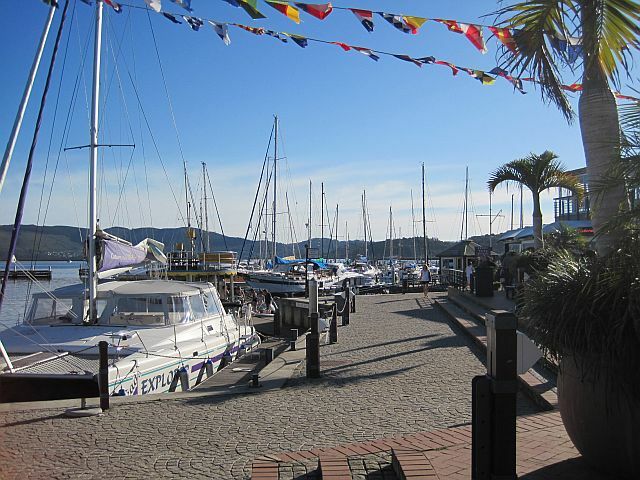 Knysna is a picturesque town set on an estuary come lagoon. 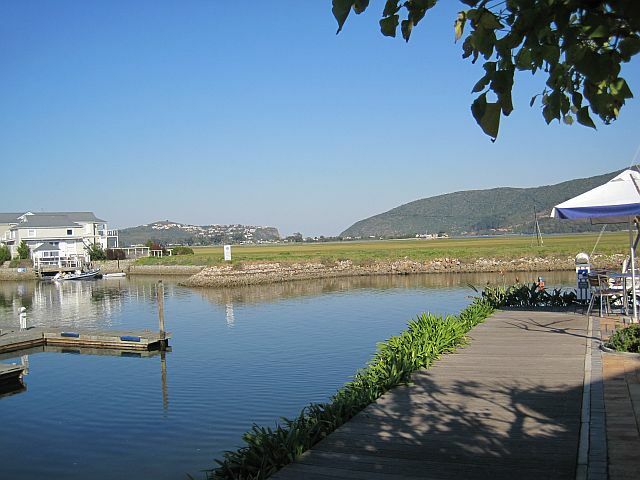 The estuary is fed by the Knysna River and the estuary in turn feeds into the ocean between two hills or “heads”. It is an aspirational town due to it’s great weather and natural beauty. High end activities such as golfing, painting and art collecting, sailing and fine dining are well represented. This is in sharp contrast to the local shanty town and Rastafarian village. It’s worth a visit into the townships to see how locals craft makeshift houses out of timber. You may be offered indigenous herbs by the Rastafarians. Partake at your own risk. Smoking cannabis is not legal in South Africa. There is lots and lots to do. Just wandering around the main town taking in the haute hippy atmosphere is a great way to spend the day. You will find no shortage of cafes, bars and restaurants to while away the time. You could visit all or just one of the many spectacular beaches or paddle a canoe in one of the national parks. 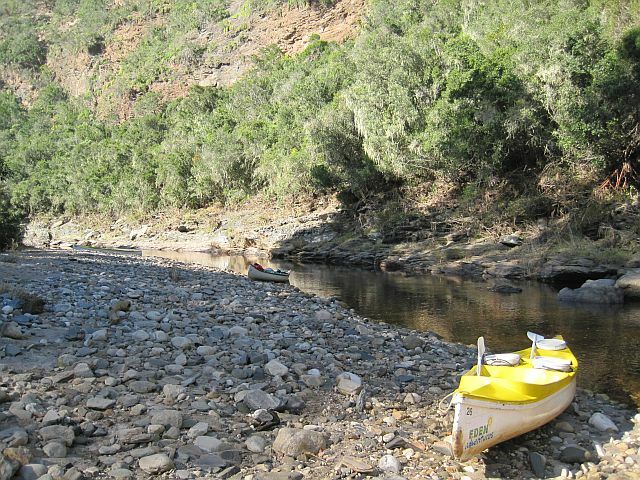 How about mountain biking in the Knysna Forest or take a cruise around the estuary? You might even fancy a visit to the elephant park? 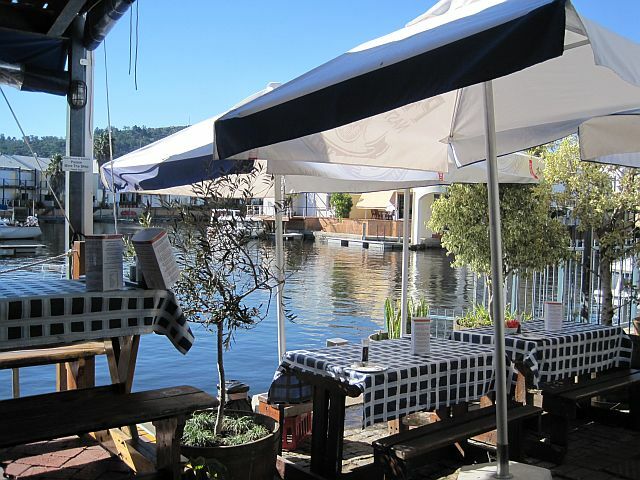 Visit the Knysna Tourism website for more on what to do and where to go. Adrenaline junkies will not be disappointed at what is on offer. If you fancy an active holiday then visit this older post which has links to the sport events calendars in South Africa – what to do outdoors in South Africa.